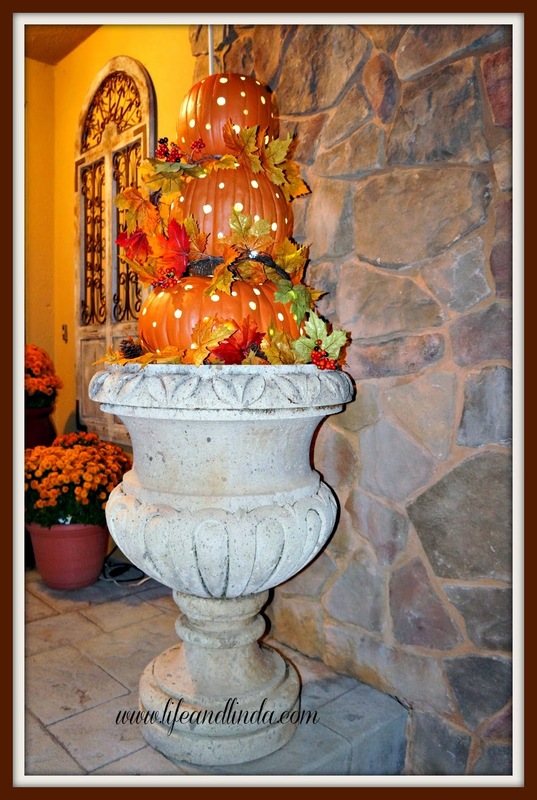 Just sharing some decor for the season....Warm colors, leaves and pumpkins makes our home cozy. I try to change things up a bit every year. Before the new ottoman...A nice coffee table, however we like to put our feet up. Here's our new ottoman. It arrived today, so we can finally put up our feet and be comfortable. I decorated the porch with mums and scare crows this year. Of course the pumpkins are also added, along with our pumpkin topiaries we made about three years ago. Stay tuned for my Glam Black and Gold Skull tablescape and Butternut Squash soup recipe. Oh, I almost forgot, we are working on our laundry room. The previous cabinets we had in our kitchen, are now in the laundry room. Probably another month, and we will be showing off the new look....Enjoy your week ahead. Oh, how cozy!! 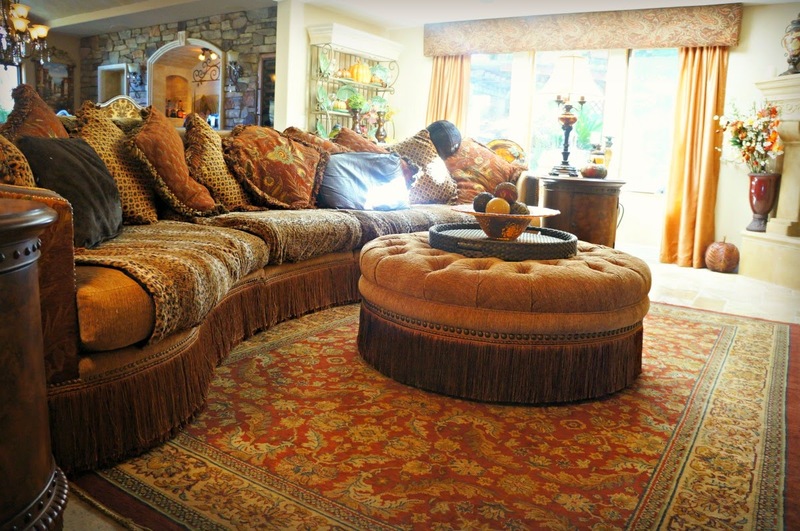 Love the new ottoman in your room, with the sofa. You'll enjoy putting your feet up in comfort now!! Looks beautiful ~ as usual! The ottoman is so nice. I would prop my feet there, have something to drink and either read a book or watch a movie. Beautiful! Those earth colors along with the spark of orange is so pretty! You have a beautiful home, Linda! You have such exquisite taste, Linda, and I know your sweet hubby does, too. Your new ottoman looks so comfy. I remember those gorgeous topiaries. Oh, how I love them! I'm so happy to have my blog roll. Now I know whenever blogs are updated!! Thank you, thank you!! Everything is drop dead gorgeous. I want every urn in your house! Everything looks just beautiful!! You are so elegant!!!! I love it! I switched to an ottoman for the same reason and I'll never go back to a coffee table. No more barked shins! Your fall decor looks lovely. Thank you for sharing your decor Linda. It's so pretty and warm. 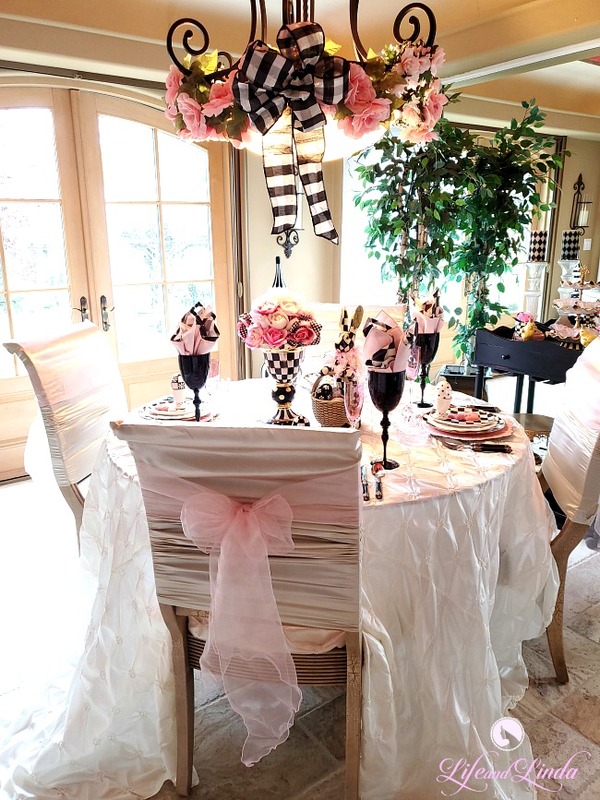 The mantel looks very pretty and so does your dining table. 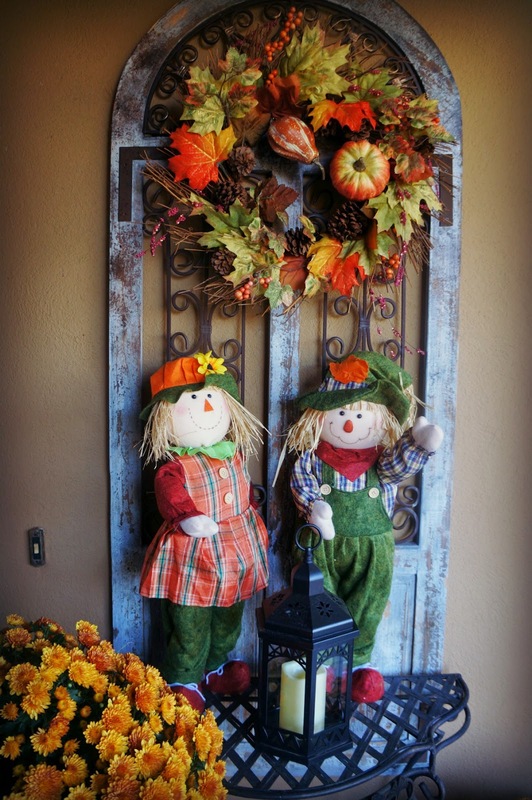 Love the front entrance with the pumpkins and scarecrows. I like the wreath mounted on that wall piece- what a great look! That new ottoman is gorgeous! I imagine you are loving it- especially since you can put your feet up more easily now. Fall is well underway here...too fast in some ways so I'm just trying to enjoy it as much as possible! Hi Linda, your home is stunning and so inviting for the season. I love all your special touches and color theme. From the front door on, it is gorgeous!! 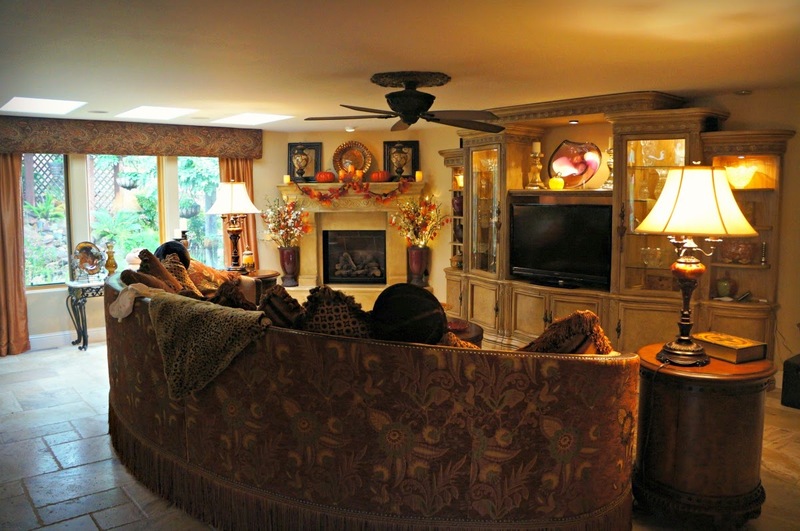 Linda, your home looks gorgeous decorated for Fall. So warm and elegant at the same time. 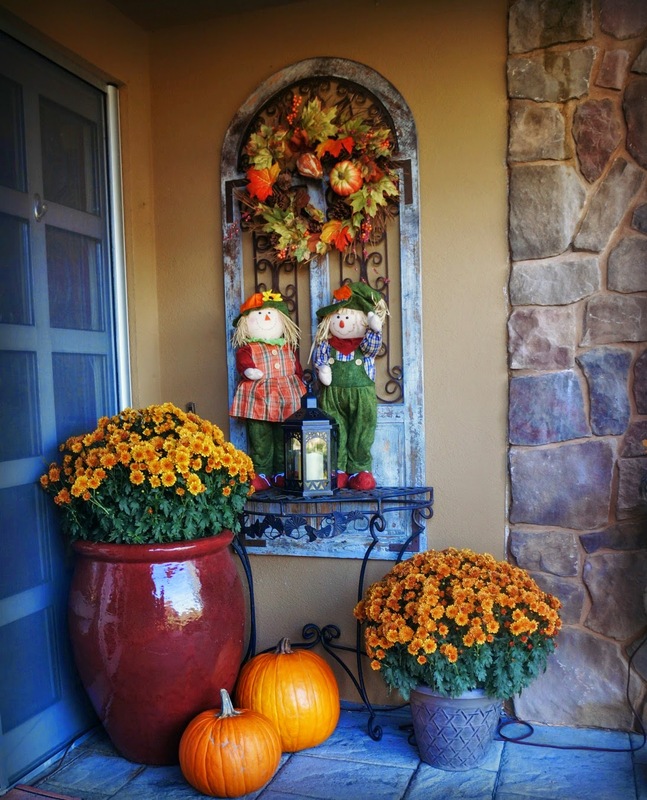 Your Fall decor is just beautiful, Linda! 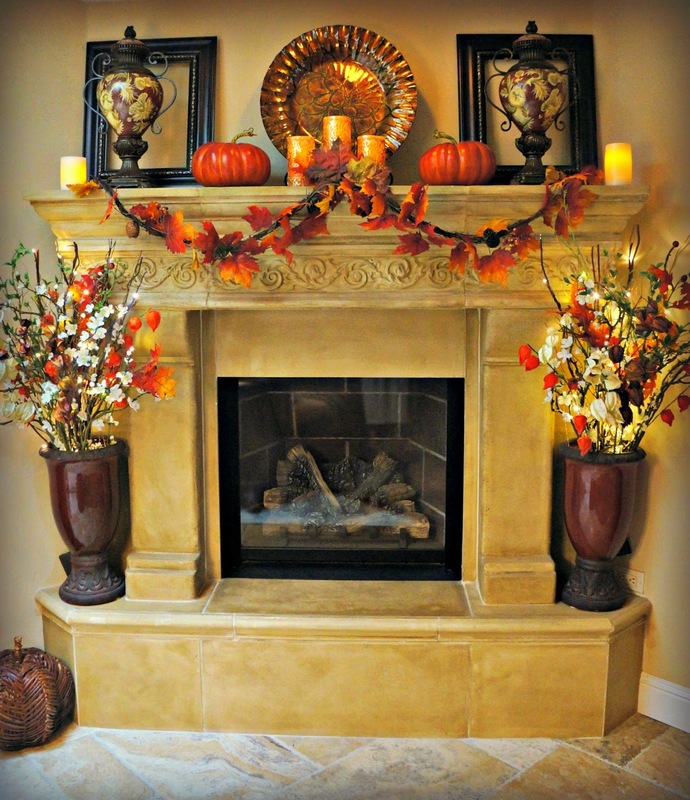 I adore how your mantel and fireplace look. 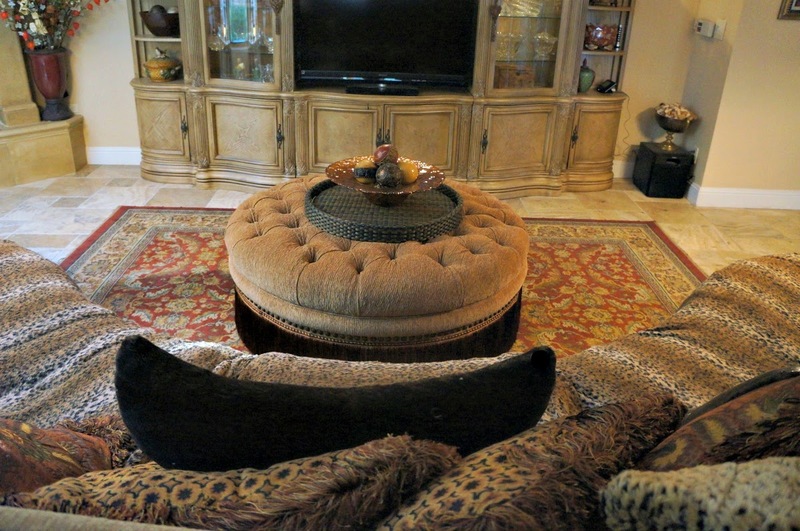 That is a lovely ottoman and really makes that area look much cozier. Happy Fall! Oh Linda!! 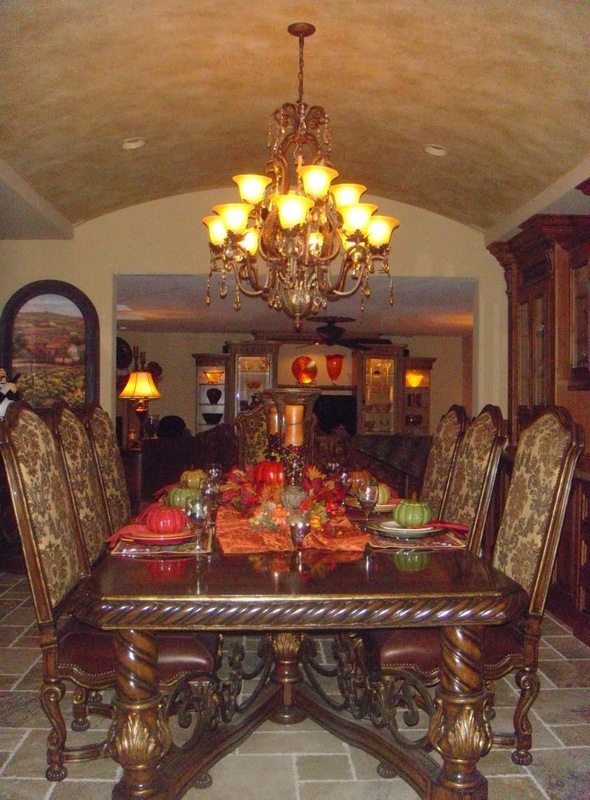 All your autumnal accents look wonderful in your gorgeous home...so warm & inviting!! Your new ottoman is just perfect in front of that curvy couch & I adore your dining room, as I've told you before. You are truly blessed, Hon & I'm so glad you're feeling well enough to enjoy your pretty things. Lovely ottoman; they're so much more comfortable and practical than the usual coffee tables. Such a cozy, autumn ambiance; perfect for cocooning! Your home is perfect for fall decorating, Linda. All the rich colors of the season work so well with your standing decor. So pretty! Heartwarming, elegant and cozy, everything here is just gorgeous! Linda, I also love your header and the black cat in it reminds me fondly of three black cats that I have had throughout the course of my life who brought me much joy and they were very sweet.